Start your Labrador Retriever puppy off on the right foot by feeding the right food, giving the right vaccinations, finding the right vet, and if you're going to spay or neuter, don't do it too early. Read my advice on daily health care so your Labrador Retriever lives a long, healthy life and seldom needs to see the vet. Food is the #1 foundation for good health. The best diet for feeding your dog is real food. Real chicken, turkey, beef, fish....these are not just "people foods" and I'll tell you why. Kibble or Canned Dog Food – Almost As Good As Homemade? Are you looking for the best dry kibble or canned dog food? My advice on the pros and cons of pet insurance, and the best pet insurance company I've found. Vaccinations and Booster Shots: Needed or Not? How many vaccinations does your Labrador Retriever puppy really need? Does your adult Lab need yearly booster shots? The vaccination guidelines have changed! Find out what some vets aren't telling you. Advantages and disadvantages of spaying your female dog. Advantages and disadvantages of neutering your male dog. Is your veterinarian really the best choice for your dog? Learn about the differences between vets who practice conventional, holistic, and alternative veterinary medicine. Does your dog suffer from arthritis, hip dysplasia, disk disease, colitis, a skin wound? My honest review of a veterinary device you can use at home to help reduce inflammation and pain. The typical lifespan of Labrador Retrievers is 10-12 years. Some do live to 13 or 14, but often with chronic health issues such as arthritis. Most large breeds, including Labs, have higher-than-average rates of hip dysplasia and elbow dysplasia, which can range from uncomfortable to crippling. Surgery may or may not be possible. These joint diseases always result in arthritis, as well. Other painful orthopedic conditions can strike young Labradors: hypertrophic osteodystrophy (very serious) or panosteitis (less serious, usually goes away with maturity, but causes pain and lameness for months). 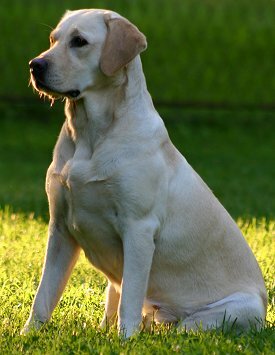 Labrador Retrievers are also prone to rupturing the cruciate ligament in their hind legs. Actually both cruciate ligaments, since when one goes, the other usually follows months or years later. When a Lab has inherited genes for progressive retinal atrophy (PRA), it will appear at 4-8 years old and always leads to blindness. Cataracts can appear anytime from birth to old age. Retinal dysplasia (RD) is fairly common in Labrador puppies, especially from field-hunting lines. RD ranges from mild to severe. Oddly enough, it can be accompanied by a form of dwarfism in which the front legs are shortened and bowed out at the elbows. Eyelid abnormalities in Labradors include entropion and ectropion. 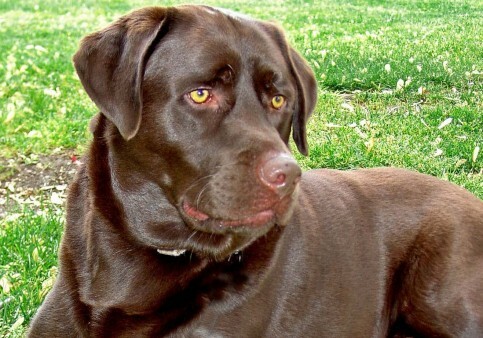 The form of heart disease that is most concerning in Labrador Retrievers is called tricuspid valve dysplasia (TVD). TVD occurs in other breeds as well, but it is inherited in Labradors. Someone thinking of breeding should make absolutely sure to test both parents for this disease. It is simply irresponsible to breed any Lab without testing for TVD. There's no cure for TVD. You just have to hope it doesn't progress too quickly. You can try to manage the symptoms with medications and careful monitoring of exercise. Allergies are common. Allergies cause itchy skin and often lead to bacterial skin infections (pyoderma). Other skin diseases in Labs include seborrhea, lick granuloma, and nail bed disease. Lumps, growths, tumors, and cancers (especially those that first appear on the skin) are fairly common in Labrador Retrievers. These include mast cell tumors, melanoma, histiocytic sarcoma, and digital squamous cell carcinoma. That last one is cancer that appears on one of the dog's toes. Yes, that sounds odd, but it's a very serious cancer. Labrador Retrievers can be affected by some extremely serious, even deadly disorders that affect the brain, nervous system, and/or muscles. The names of these conditions are a real mouthful to say, but you should be aware of them if you're interested in Labs. Polyneuropathy (specifically centronuclear myopathy), laryngeal paralysis, megaesophagus, myasthenia gravis, cerebellar ataxia, and narcolepsy.... all occur in Labrador Retrievers. Some Labs may have vague head tremors that aren't harmful, but may be the result of unknown abnormalities in the brain. Finally, there is exercise-induced collapse (EIC) which is exactly what it sounds like. It first appears in older pups and adolescents, especially those from field/hunting lines. EIC only appears when the dog is exercising vigorously – not just running around, but participating in a strenuous activity (such as a hunting field trial) where the dog is extremely excited and intense. An affected dog suddenly becomes incoordinated and begins swaying, then collapses and requires a rest of 10-20 minutes before he can move again. The cause of EIC is not known for sure. But it is hereditary in Labs, so it's important to test at least one parent before breeding. Fortunately, it's a mostly benign condition that need only be managed sensibly, by restricting intense exercise in dogs who have inherited the disorder. As with all deep-chested breeds, Labrador Retrievers are at higher-than-normal risk for the emergency gastrointestinal syndrome called bloat. Epilepsy, which appears around the age of 2 or 3, has become a serious concern in the breed. Hormonal/endocrine system diseases occur in Labs, especially hypothyroidism, but also diabetes and Addison's disease. Blood-clotting diseases (von Willebrand's, hemophilia A, hemophilia B) are potential concerns in Labrador Retrievers. Some health problems are inherited. For example, if both parents of your Labrador Retriever have certificates proving they were tested and cleared of hip dysplasia, elbow dysplasia, and eye diseases, your Lab has less risk of developing those conditions. Other health problems can be prevented, or partially prevented, by the ways you raise your dog. My best-selling book, 11 Things You Must Do Right To Keep Your Dog Healthy and Happy shows you how to raise your Labrador Retriever puppy (or adult dog) in all the right ways. It will help you be your dog's health care champion! About the author: Michele Welton has over 40 years of experience as a Dog Trainer, Dog Breed Consultant, and founder of three Dog Training Centers. An expert researcher and author of 15 books about dogs, she loves helping people choose, train, and care for their dogs. Dog training videos. Sometimes it's easier to train your puppy (or adult dog) when you can see the correct training techniques in action. 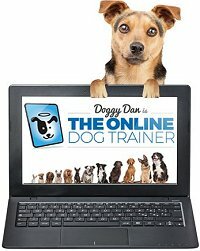 The problem is that most dog training videos on the internet are worthless, because they use the wrong training method. I recommend these dog training videos that are based on respect and leadership. Respect Training For Puppies: 30 seconds to a calm, polite, well-behaved puppy. For puppies 2 to 18 months old. Your puppy will learn the 21 skills that all family dogs need to know. If your dog is over 18 months, you'll want Respect Training For Adult Dogs: 30 seconds to a calm, polite, well-behaved dog. Again your dog will learn the 21 skills that all family dogs need to know. Teach Your Dog 100 English Words is a unique Vocabulary and Respect Training Program that will teach your adult dog to listen to you and do what you say. 11 Things You Must Do Right To Keep Your Dog Healthy and Happy helps your dog live a longer, healthier life. Dog Quest: Find The Dog Of Your Dreams will help you find a good-tempered, healthy family companion. Copyright © 2000-2019 by Michele Welton. All rights reserved. No part of this website may be copied, displayed on another website, or distributed in any way without permission from the author.